U.S. 199 follows the Redwood Highway from U.S. 101 north of Crescent City to Interstate 5 at Grants Pass, Oregon. U.S. 199 is also part of the long Winnemucca to the Sea Highway. Originating in Winnemucca, Nevada, the auto trail overlays U.S. 95 north, multi state route 140 west and U.S. 395 to Oregon 62 west. I-5 leads the highway north to Grants Pass, with U.S. 199 extending it southwest to Crescent City and the Pacific Ocean. 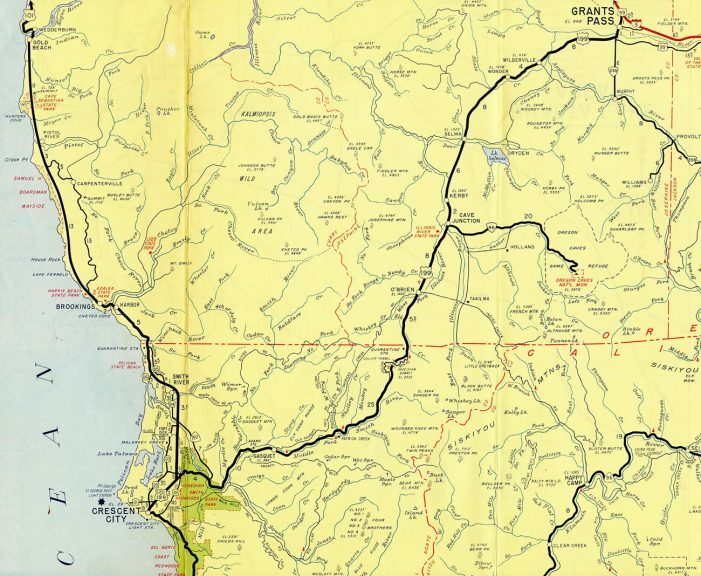 This route was once considered to be unified under a single U.S. highway number. Prior to 1964, U.S. 199 used to extend south on a concurrent alignment with U.S. 101 south into the city of Crescent City. The overlap was eliminated, with U.S. 199 retracted to its interchange with U.S. 101. This suite of photos follows old U.S. 199 southbound over Oregon Mountain Road. Oregon Mountain Road is the original route of U.S. 199, and it passes over the current route of U.S. 199 through the Collier Tunnel. The old route is passable, with one gravel section near the Oregon Mountain Summit. Some sections of the route are overgrown with weeds and trees, and other parts have exposed rocks and earth. Certain curves are switchbacks with a 10 mile per hour advisory speed. Remnant white striping can still be seen on portions of the road, in addition to old guardrail and curbing. At no point along the route is the Collier Tunnel visible. 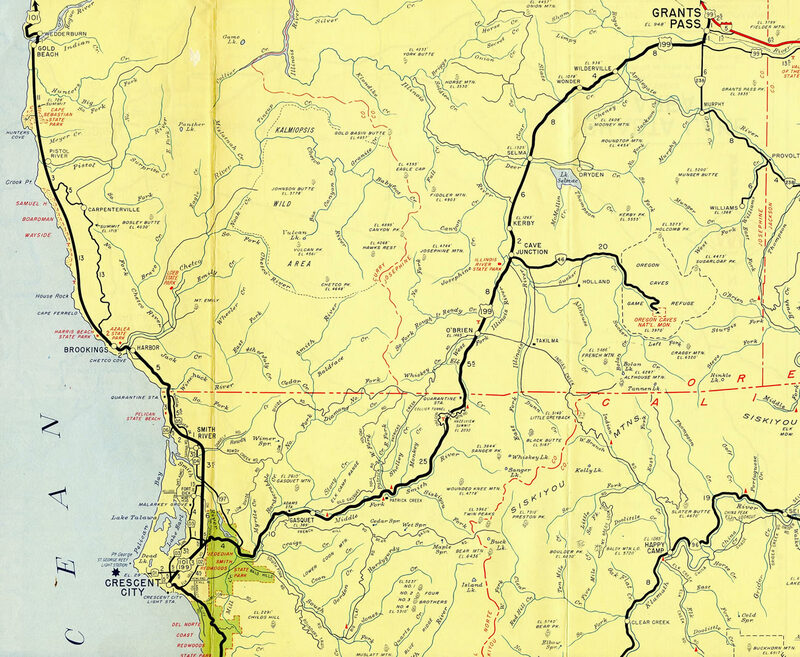 The old alignment is mileposted as Del Norte County 324. It reconnects with U.S. 199 on the south end of the tunnel. Oregon Mountain Road south. Photos taken 05/28/06. Street blade assembly showing U.S. 199 as State Highway 199, posted at the intersection of U.S. 199 and Oregon Mountain Road, between the Oregon state line and Collier Tunnel. Photo taken 05/28/06. This U.S. 199 shield is posted at the north end of Oregon Mountain Road, which is also the old alignment of U.S. 199. Photo taken 05/28/06. This mileage sign at the Oregon Mountain Road intersection with U.S. 199 north of Collier Tunnel provides the distance to Crescent City, 46 miles to the southwest, and Grants Pass, Oregon, 43 miles to the northeast. Photo taken 05/28/06.